After the arrival of the Ontario Simcoe and Huron railway in 1853 and formation and use of many building lots in the village of Machell’s Corner, in the Township of Whitchurch, Mr. Charles Doan proposed the new name of Aurora for the village. In 1863 the village officially became Aurora. In 1867, Charles Doan purchased 4 1/2 acres of land on which he had the Charnal House (Dead House) built in 1868. Mr. Doan sold these lands to Aurora Cemetery Company which was formed in 1869. In 1879, the company contracted with local builder Henry Harris to construct the “Keeper’s House” at the entrance to the cemetery. 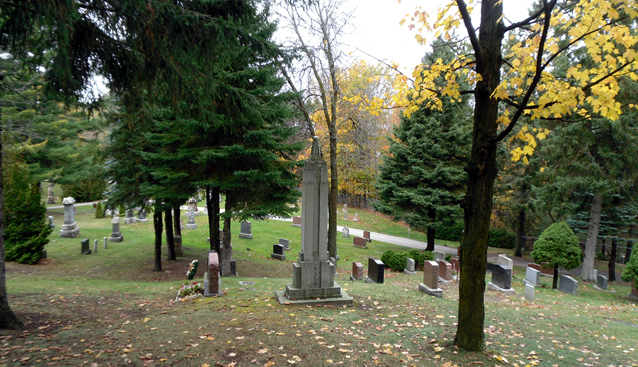 The development of the cemetery as a fine example of a late Victorian period “garden cemetery” and the Keeper’s House being the only example in Aurora of the elaborated Second Empire Style of building led to the Town of Aurora designating the property in 1997 as a historic site under the Ontario Heritage Act, 1980. 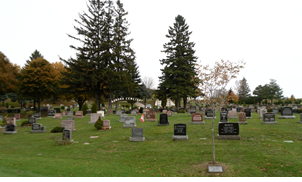 The cemetery is an invaluable source of genealogical information, particularly for the period prior to 1869 when the first law was passed requiring births, marriages and deaths to be recorded by a provincial registrar in Ontario, previously Upper Canada and Canada West. The spring is a very busy time of year for us with the spring cleanup and we ask for your patience as we get the cemetery ready for summer. We want to keep you updated with the projects we have in store for 2019. 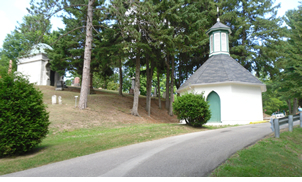 We have added a new columbarium section in the south end of the cemetery; we will be landscaping the area in the spring-summer of 2019 and will add more buildings as they sell. It will add a beautiful setting for visiting loved ones. Aurora Cemetery Corporation is a not-for-profit cemetery so all donations are welcomed and are tax deductible. We never want to forget our War Vets who lost their lives for us; please remember to come out and enjoy the spectacular candlelight service & ceremonial service the 3rd weekend in September. We have added a service of selling monuments and flat markers for your convenience. Did you know that it is the responsibility of the family to arrange a date of death inscription to be completed on existing monuments? The office can assist you with these arrangements. Please remember that we have by-laws as to what is allowed on the lots, we have people placing too many decorations on the ground as it interferes with our daily maintenance and it makes the cemetery look messy. From early spring to late fall garbage containers are placed throughout the cemetery; please use them. When visiting in winter do not litter; please take your garbage with you. The Aurora Cemetery Corporation is governed by a volunteer board of directors. These are busy members of our community who generously give their time and energy to help guide and direct the future of the Aurora Cemetery. For more information visit our Website. www.AuroraCemeteryCorporation.com. Can I care for the flowerbed myself? Yes, we permit people to care for their own flowerbed. However; all flowerbeds require a surround, must conform to the size guidelines, and they must be cared for. We reserve the right to remove any flowerbeds that are either too big and/or are not being cared for. You can start planning any time after May 1st. Why the importance of a surround? It ensures the safety of our employees when they trim around them. The surround not only protects the flowers from the machines, but also keeps the dirt in the flowerbed. How big can the flowerbeds be? Where there is a monument it shall not exceed the width of the monument and a depth of 18”. Before digging a flowerbed check with the General Manager. When should I enter into a contract for my flowerbed? We start taking order by March 1, we start planting flowerbeds by May long weekend. When does the water get turned on and off? We aim to have the water turned on by April 30. In the fall, end of October we shut off the water. If you have the time to help we would appreciate anytime that you could help us with the outdoors. Yes, you can. You can purchase a tree or a bench or even donate money towards the repair of monuments. Receipts are issued for donations of twenty dollars or more. Can we bring in our pets? Yes, as long as they are on a leash, and please clean up after them. Why the importance of updating your files? The Aurora Cemetery was established in 1869 and many of your ancestors purchased large family lots. On a day to day basis we are being approached by people, the descendants, wishing to be interred with their ancestors. However; as a family lineage increases so does the complexity in determining who has permission to be interred in a family plot. Wherever possible, Interment Rights should be transferred to the current generation. Be advised there is an administrative fee for this service. At the very least, our records need to be updated with a current contact name, address and phone number. Please inform the members of your family and friends of the policies and rules which govern the use and protection of the cemetery grounds. By-laws were updated July 2012.